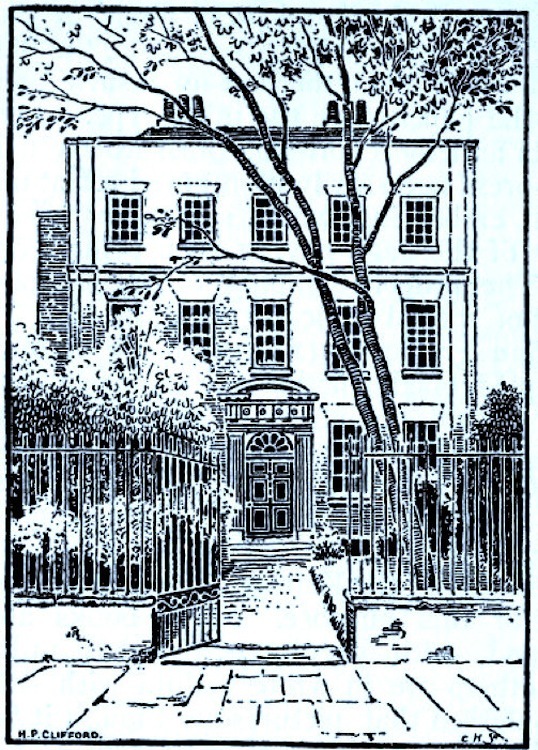 Left: "Exterior of house occupied in part by the Kelmscott Press," from a drawing by H. P. Clifford (Vallance 394): the first home of the Albion Printing Press, at 16 Upper Mall, Hammersmith. Right: The press at Kelmscott House, 26 Upper Mall, today: it is now installed in the old kitchen here. Aymer Vallance explains that William Morris had planned to herald the Kelmscott Press with The Golden Legend, a medieval collection of saints' lives, but was disappointed with the paper, so instead printed a small edition (200 copies) of his own socialist fantasy novella, The Story of the Glittering Plain, not illustrated but with decorated capitals, setting up the first page on 31 January 1891. This, says Vallance, was therefore "practically the date of the foundation of the Kelmscott Press" (393), when it was at 16 Upper Mall, Hammersmith, very close to Kelmscott House at 26 Upper Mall. Later the press was set up in 14 Upper Mall. The book's "successful reception showed Morris at once the opening there was for books of the kind" (Vallance 394). The Golden Legend was printed as his seventh book in 1892, and he reissued a heavily illustrated version of The Glittering Plain in 1894, making it the only book he printed twice. Close-up of the top of the press. The Albion Press, invented by Richard Whittaker Cope in the early part of the century, and other presses derived from it, figured largely in the "private press movement" of these times (Moran 91). 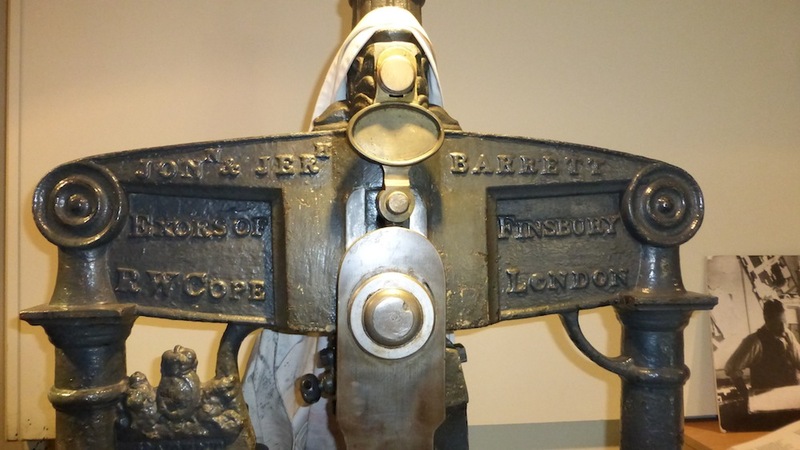 After Cope's death his business in Finsbury was run by his executors, Jonathan & Jeremiah Barrett, whose names can be seen above his at the top of Morris's press (see Moran 94). This model was used not just by Morris but also by his near-neighbour T. J. Cobden-Sanderson at the Doves Press, and others. Morris of course liked a traditional hand press, "the old method being also, in his opinion, the best for insuring an equable pressure of the paper upon the inked type." It had an authenticity that he appreciated: "The damping of the paper and the enormous pressure exerted by the Albion hand-press necessarily reproduced a feature of old books, to wit embossing, which sometimes gives pronounced evidence of the page having been printed on the reverse side" (Vallance 394). 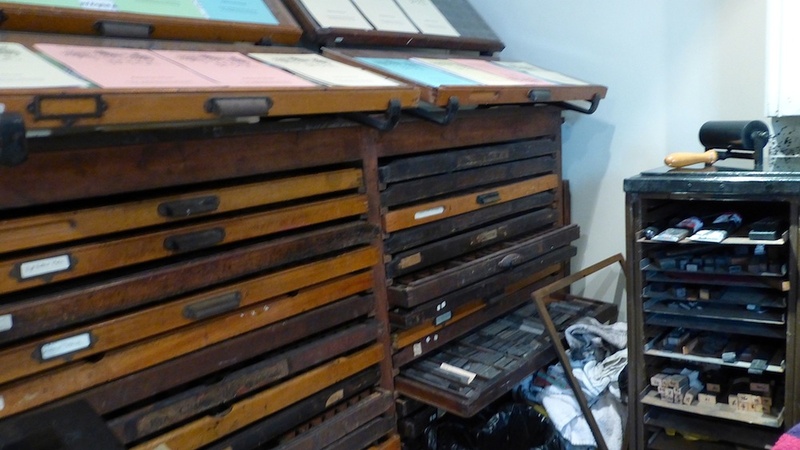 Left: Letter-press drawers beside the press at Kelmscott House. 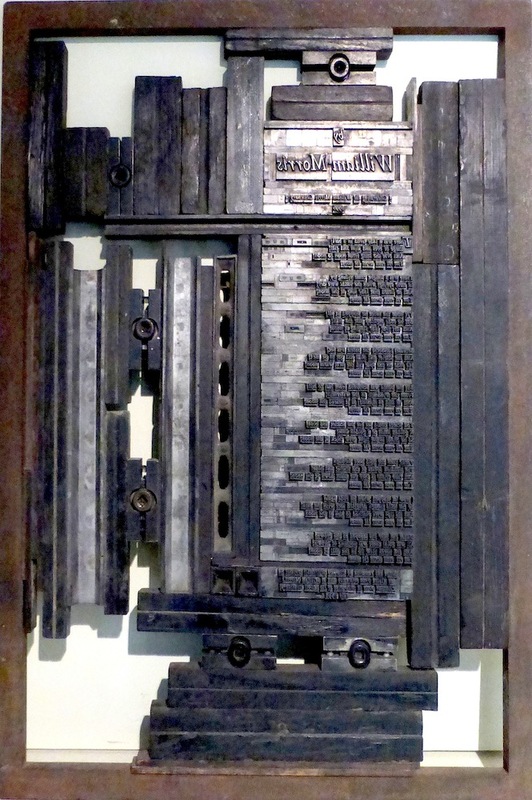 Right: Movable type on a printing block behind the press. 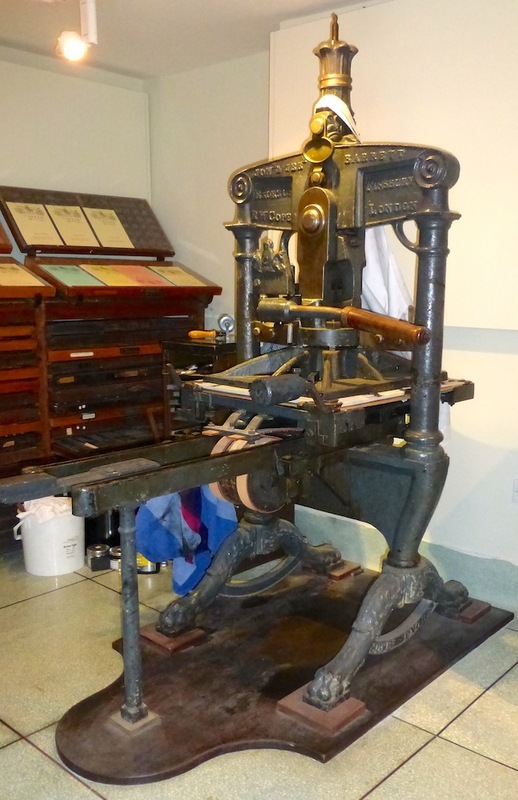 The press, as installed in the basement of 26 Upper Mall, and accessed from its coach-house, is in good working order and is now used by the William Morris Society. Its most famous production was (and is) the Kelmscott Chaucer of 1896. 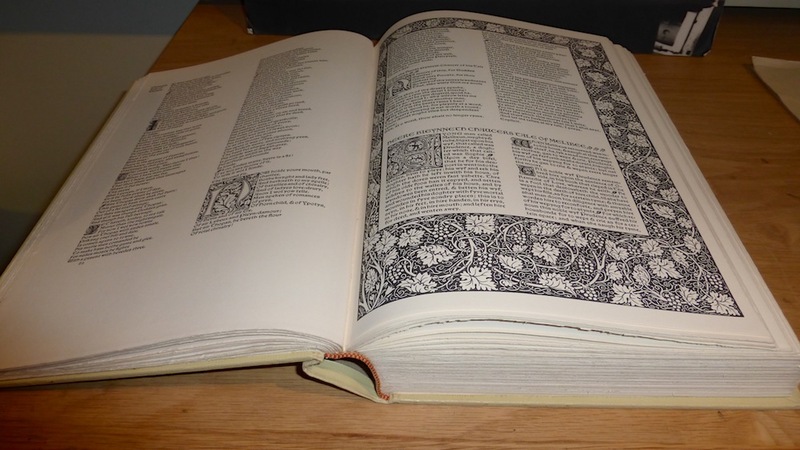 Copy of the Kelmscott Chaucer on display in the room, open at the beginning of The Tale of Melibee, "a litel thing in prose," which many editions omit because it turns out to be not so "litel" after all! Moran, James. Printing Presses: History and Development from the Fifteenth Century to Modern Times. Paperback ed. Berkeley and Los Angeles: University of California Press, 1978. Vallance, Aymer. William Morris: His Art, His Writings, and His Public Life: A Record. London: George Bell, 1898. Internet Archive. Contributed by the Getty Research Institute. Web. 3 April 2015.